Born in Buenos Aires, Argentina, Juan has been living and exhibiting work in Costa Rica since 2002. With secondary and tertiary studies in Buenos Aires, he graduated in 1975. Alfonsin has worked as Professor of painting at community centers dependent on the city of Buenos Aires, including masks and painting workshops for children and adolescents; and participated with the group Coperanza at the workshops conducted at facilities of the Hospital Borda. Workshops held once a week in the hospital. Coperanza was the first of its kind, and was imitated by other groups in the world working also with psychiatric hospitals. Palatine Gallery Abstract Painting: member of a group of artists selected by the gallery to ARTEBA (Art Buenos Aires) Annual Event Art Gallery Representationof the Palatine Gallery. Group exhibition with the artist group Coco Bedoya Resistant group of artists of the military dictatorship. Together this group made several presentations Street Art Collective with the intention of supporting the fledgling democracy in the country. 1987 Emilio Petorutti Gallery solo show: New Abstraction. Group show with teacher Giussano, along with other artists and sculptors to mark a new anniversary of democracy. Permanent exhibition (through 1993) at Feria de San Telmo, popular artistic and cultural events, with the participation of visual artists and musicians; Art expo is "for the people of Buenos Aires and the domestic and foreign tourism in the artistic and bohemian neighborhood of the capital." 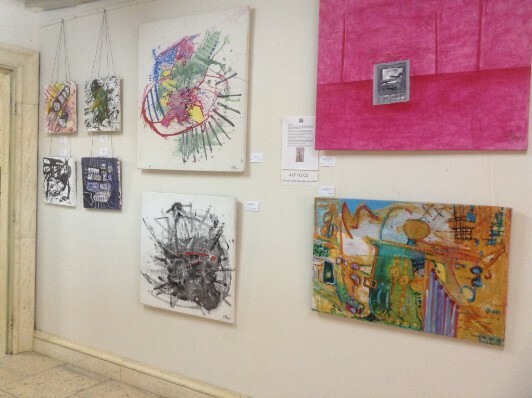 Solo and group exhibits in different events related to these community centers in the city of Buenos Aires as a way to bring art and the ability to learn to the most vulnerable sectors of society.